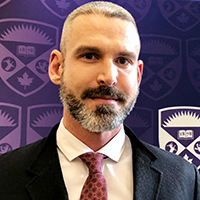 Brenton Faubert is an Assistant Professor in the area of Educational Administration & Leadership at the Faculty of Education, Western University. Dr. Faubert conducts most of his research in the context of K-12 education in the overlapping areas of Education Finance, Administration, Governance, and Policy. Brenton’s current research in finance & administration focuses on calibrating and expanding an evidence based adequacy model, originally developed in the U.S., for application in the Canadian context to determine adequate levels of school and district resources required to deliver a high-quality education program to all students. His recent work in educational governance & policy examines how the four Ministerial Education Councils in federated countries address educational issues of national interest in their respective jurisdictions. Dr. Faubert began his career as a classroom teacher and later worked in various education research and policy roles, including the Ontario Ministry of Education, the Council of Ministers of Education, Canada (CMEC), and Organisation for Economic Cooperation and Development (OECD). He completed his Ph.D. at the Ontario Institute for Studies in Education (OISE), University of Toronto in the areas of Educational Administration and Comparative, International and Development Education. This project addresses an issue generating considerable debate in both national and international spheres. The debate is over whether current levels of school- and district-level resources are sufficient to provide all students with the opportunity to learn at the high performance standards set by the government. This project is Phase 2 of a larger, four-phase study aimed at estimating the resource levels and associated expenditure required to achieve finance adequacy for one Ontario public school board for one school year; it will do so by using an evidence-based funding model, developed and tested by U.S. researchers, but calibrated for the province’s K–12 public education context. Phase 2 of the study involves working with one Ontario school board to pilot the model by applying the resource recommendations to one elementary, middle, and secondary school, as well as the district office; after this pilot stage, the model will be applied to all of the remaining schools in the board. Outcomes of the study include pioneering a method to calibrate and empirically test the model in the Ontario context, which could be replicated in other Canadian and international educational jurisdictions. Empirically, the proposed study is also timely as the estimates have the potential to inform the aforementioned current academic and public debates on adequate levels of school resourcing. Relatedly, the study will provide direction for system and district leaders in Ontario regarding the allocation of resources, such as the adequate number of paraprofessional support workers in schools. Currently, no such direction exists. This project is Phase 1 of a larger, four-phase study to estimate the resource levels and associated expenditure required to achieve finance adequacy for one Ontario public school board for one school year. Specifically, this phase examines how an evidence-based adequacy funding model, developed by US researchers Dr. Allen Odden and Dr. Lawrence Picus, can be calibrated to Ontario’s K–12 public education context. The research underlying components of the model (e.g., class size, staffing levels, etc.) drew from empirical research conducted exclusively in the U.S.—therefore, it needed to be calibrated before it could be applied in Ontario. The evaluation study was conducted to better understand suspension and expulsion program implementation and to determine the effectiveness or impact of programming and prevention activities. Related to resourcing, the final report also includes a review of the services provided using the related annual funding allocated through the Ontario Grants for Student Needs (GSN) funding formula. The final report has been submitted to the Ontario Ministry of Education. A copy of the report will be made publicly available shortly. This study sought to address a gap in available research by investigating: What is the current state of educators’ professional learning in Canada? The research team conducted reviews of academic research literature concerning professional learning and of publicly available documents for Canadian provinces and territories and Pan-Canadian sources. A national Advisory Group was formed, which provided relevant research, data, documents, and examples of promising practices. In collaboration with the Canadian Teachers’ Federation, focus groups, conference calls, and requests for additional resources from teachers’ organizations in Canada’s provinces and territories were completed. New empirical research was conducted through in-depth case studies in Alberta, British Columbia, and Ontario, plus a survey. The final report is available for review: see Recent Publications, Technical Reports. Faubert, B. (2018). Canada higher education funding. Manuscript submitted for publication. Faubert, B. & Paulson, E. (2018). Education in the echo chamber: Understanding K-12 education governance in Ontario, Canada. Manuscript submitted for publication. Faubert, B., Pollock, K., Hauseman, C. (2018). Superintendents’ work (intensification) in a shifting policy climate: Enacting a student discipline strategy. Manuscript submitted for publication. Faubert, B., Ho ai Le, A.T., Wakim, G., Swapp, D., & Watson, K. (2019). Calibrating the Evidence-Based Adequacy Model across educational contexts: Policy and leadership as powerful influences. International Journal of Education Policy and Leadership, 14(5). Osmond-Johnson, P., Campbell, C., Faubert, B. (2018). Supporting professional learning: The work of Canadian teacher organizations. Professional Development in Education. DOI: 10.1080/19415257.2018.1486877. Faubert, B., Campbell, C., & Osmond-Johnson, P. (2018). Enabling educator professional development through resourcing: A pan-Canadian perspective. International Studies in Educational Administration, 46(2), 71-91. Faubert, B. (2017). [Review of the book The end of public schools: The corporate reform agenda to privatize education, by D. W. Hursh]. Canadian Journal of Educational Administration and Policy,182, 9–12. Faubert, B. (2016). The cost of secondary course failure: The case of Ontario. Canadian Journal of Educational Administration and Policy, 181, 1–37. Campbell, C., Osmond-Johnson, P., & Faubert, B. (2016). Developing teachers as the learning profession: Findings from the state of educator’s professional learning in Canada study. Scottish Educational Review, 48(2), 3–23. Faubert, B. (2015). [Review of the book The principal as human resources leader: A guide to exemplary practices for personnel administration, by M. S. Norton]. Leadership & Policy in Schools, 15(3) 384–387. Bascia, N., & Faubert, B. (2012). Primary class size reduction: How policy space, physical space, and spatiality shape what happens in real schools. Leadership and Policy in school, 11(3), 344–364 . Sá, C., Faubert, B., Edelstein, H., & Qi, J. (2012). Understanding how organizations use the Internet to mobilise knowledge: Findings from the field of education. International Journal of Management in Education [Special Issue], 6(1–2), 1–21. Sá, C., & Li, S., & Faubert, B. (2010). Faculties of education and institutional strategies for knowledge Mobilization: An exploratory study. Higher Education: The International Journal of Higher Education and Educational Planning, 61(5), 501–512. Pollock, K., Faubert, B., Hauseman, C., & Bakker, P. (2017). Ontario’s suspension and expulsion program evaluation: Final report. Ontario Ministry of Education, Toronto, ON. Pollock, K., Faubert, B., Hauseman, C., Bakker, P., & Chiodo, D. (2016). Ontario’s suspension and expulsion program evaluation: Interim report. Toronto, ON: Ontario Ministry of Education. Chiodo, D., Pollock, K., Faubert, B., Hauseman, C., & Bakker, P. (2016). School suspension and expulsion literature review: Technical report. Toronto, ON: Ontario Ministry of Education. Campbell, C., Osmond-Johnson, P., & Faubert, B. (2016). The state of educators’ professional learning in Canadaliterature review: Technical report. Learning Forward: Oxford, OH. Faubert, B., & Blacklock, C. (2012). Review of evaluation studies on reducing failure in schools and improving equity. Project analytical paper. OECD, Paris. Bascia, N., Connelly, C., Flessa, J., Mascall, B., Chindalo, P., Faubert, B., Fredua-Kwarteng, E., Leung, J., & Rottmann, C. (2010 ). Ontario’s primary class size reduction initiative: Report on early implementation. Prepared for the Canadian Education Association and the Ontario Ministry of Education. Mady, C., Arnott, S., Faubert, B., & Lapkin, S. (October, 2008). Evaluation of SEVEC’s summer youth volunteer program. North Bay, ON: Nipissing University.